Geraldo is unable to handle the big waves. We’ve all seen the evidence of that, but he didn’t have Shane Wilmott teaching him. 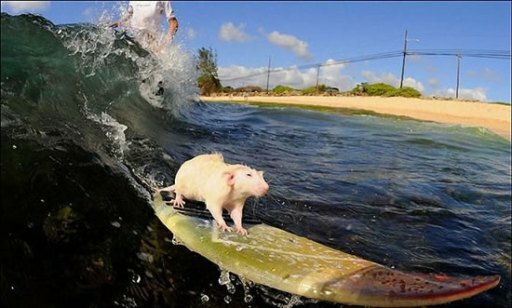 If the Aussie can teach mice to surf, he can teach anyone (or anything) to ride the waves. Maybe even me! Now, I know you’re looking at the picture above, or in the picture gallery at Oddity Central, and you’re thinking to yourself, “That’s got to be Photoshop.” That’s what I thought, too, so I’m taking the liberty of reposting the video below, and linking to an old article from Orlando, Florida’s WKMG Channel 6 that proves that yes, those are mice and yes, they are surfing. Maybe I should hunt Shane up. I can’t surf, I can’t water ski, I can’t skateboard, and I can’t even roller skate. I have a sense of balance only slightly better than a drunk one-legged man on stilts. Well, a stilt, I guess.